If asked to list Perth’s ten worst buildings, this office would definitely include London Court. A cut-price Disneyland Tudor street scene, it was erected in 1937 by shady miner, Claude de Bernales. How bad does a building have to be to get condemned from the pulpit? Rev Iona Williams described it as so ugly, London Court was an offence against God Himself. Preaching at Trinity Congregational Church, the good reverend said the arcade was a admission that architects had no original ideas. Architecture should be about the now, not a repetition of the past. But what would a theologian know? Let’s get the opinion of an architect. A poor imitation of Tudor architecture, the architect spluttered, before lashing out at the ridiculous Punch and Judy clock. When archaeologists of the future excavate the arcade, he said, they will be baffled as to why it was erected in the first place. In any case, a good archaeologist would immediately rebury the monstrosity. Warming to his theme, the architect demanded to know where it would all end? A Leaning Tower of Pisa outside the GPO? Stonehenge on the Esplanade? In a blistering conclusion, he said the only thing that should be doing impressions is a monkey. And a monkey would probably have made a better job of the London Court anyway. As you can see, London Court has been much loved ever since it was erected. 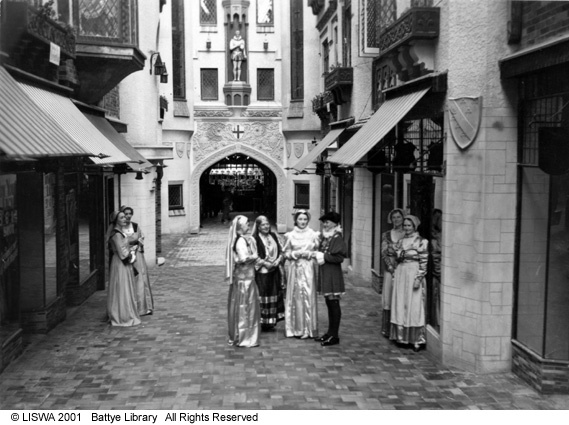 If he’s remembered at all, Claude de Bernales is famous for having built the gaudy mock-Tudor shopping arcade, London Court. Described as a “mining promoter and investor”, he is also said to have been “larger than life”. Those who lost their savings in his fraudulent schemes would have called him a con man. Flashy and egotistical, de Bernales was the one of the biggest personalities ever to set foot in Perth. But he gambled on gold in a big way—and lost. Lost other people’s money, that is. 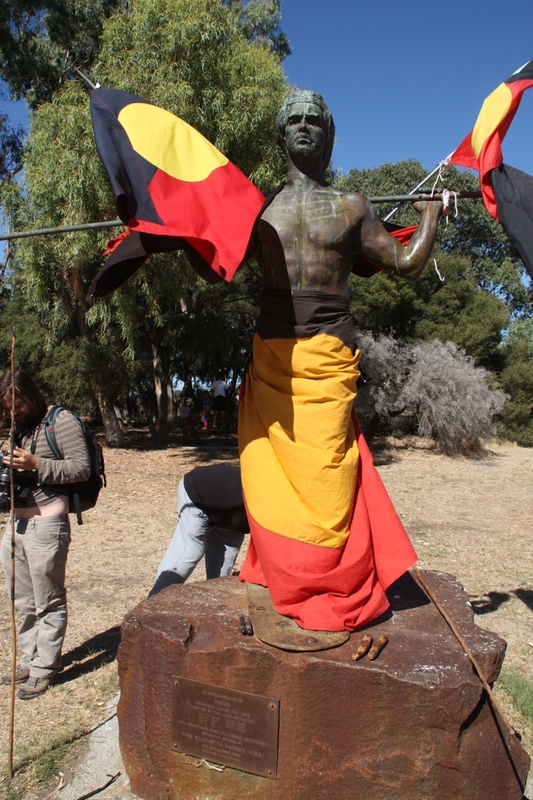 In his youth, de Bernales was well-known on the goldfields. Traveling the dusty fields on a push-bike, he would arrive at a mine, and put on a spotless shirt and collar before presenting himself to the manager to sell his machinery. Before World War I he bought up as many derelict mines as he could. Some were flooded, few were workable. 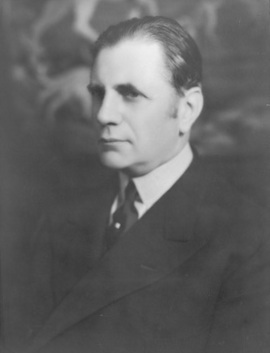 After the war, de Bernales created a labyrinth of interlocking companies, and floated his mines on reports of old workings. Only one mine, Yellowdine, ever paid dividends, but even that failed to live up to its promise. In a classic Ponzi scheme, interest in his numerous companies was kept alive by dividends drawn from Yellowdine. At his peak, de Bernales’ office was adorned with Flemish tapestries, African mahogany paneling, and a luxury bathroom lined with marble. Visitors were offered the best cigars and liquors. However, in 1939 eight of his companies were barred on the London Stock Exchange. He faced many stormy shareholder meetings, where he indignantly denied allegations of fraud. But when Scotland Yard sent two detectives in 1946 to Australia to investigate, the whole rotten scheme came to a sudden end. A man who built an empire entirely made of smoke and mirrors also built London Court. What a surprise.